For Velo Aficionados who like all the details here's a summary of every 100 km Olympic and UCI World Championship Team Time Trial event. Cycling World Championships Team Time Trial 1962 – 1994 and Olympic Games 1960 to 1992. Knud Enemark Jensen of Denmark participated in the 100 km Team Time Trial event in Rome he collapsed during the race, fractured his skull, and was pronounced dead in a nearby Rome hospital shortly thereafter. The autopsy showed he had taken amphetamine and another drug, Roniacol (Ronicol/Roniacol Retard, Nicotinyl alcohol tartrate), a direct-acting peripheral vasodilator that causes flushing and may decrease blood pressure. He was also reported as swallowing eight pills of phenylisopropylamine and fifteen pills of amphetamine and coffee. On March 24, 1961, the three physicians who performed the autopsy submitted a final report stating that the death was caused by a heat wave, not by the drugs found in his body. The chairman of the Dutch cycling federation, Piet van Dijk, said of Rome that "dope - whole cartloads -[were] used in such royal quantities." 1966 25 August Cologne GermanyUCI Cycling World Championships Course through the Rhein-Erft-Kreis from Kölner Müngersdorfer Stadium beginning and finishing in the stadium. The race was run during heavy storms. 100 km - 17 Teams started. 1st SWEDEN 2:03:07 AVS 46.9798 km/h Gösta Pettersson | Sture Pettersson | Erik Pettersson | Tomas Pettersson. 1968 Montevideo - ImolaUCI Cycling World Championships first world championships in South America, the Olympics were held that year in Mexico so it was decided that the worlds would be held nearby too. 100km The smallest number of teams ever to compete, only eight teams were on the start line in Montevideo. Few teams took part because of the high expense involved with traveling from Europe. 1987 2nd September : Villach Austria UCI Cycling World Championships held on the Autobahn from Villach to the Italian border and return, with four turns, finishing on the last few kms of the road race circuit. 100 km, 26 Teams took part. Apparently at a meeting of UCI officials and team representatives prior to the race, the actual course distance was declared as being 101 km, not 100 km as stated on the timing sheets, if this is correct, not verified (Source : Australian Team Manager who was present at that meeting) the performances and times recorded at Villach are even more impressive. 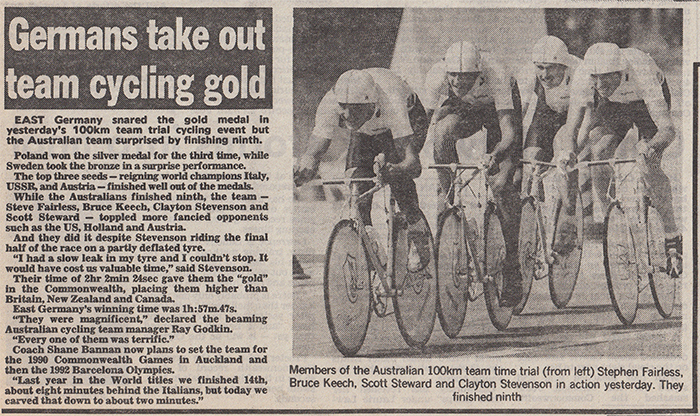 Australian team at Villach Austria 1987 UCI cycling teams time trial world championship. L to R Clayton Stevenson, Steve Rooney, Stephen Fairless, Robert Cobcroft. Photo courtesy of Steve Rooney. 1992 26 July : BarcelonaSpain Olympic Games Cycling 102.8 km using the motorsports Circuit de Catalunya in Montmeló as the start - finish line.